What is White Glove Delivery (In Home)? $450 total for your entire order to the contiguous U.S.
At Deutsch Amish Furniture, we know that the successful delivery of your furniture is critical to your purchase, and guarantee a complete world-class shopping experience by providing our own delivery service—from our home in Rochester, MN to yours. All items blanket-wrapped and strapped down for safe travel. Placement of your new furnishings in the room of your choice, including additional floors. Complete assembly, set-up and installation of every piece. Product damage is rare, though, if damage is found, first the customer should note the damage on the packing slip on the delivery receipt provided by the driver and then sign. Next, please contact Deutsch Amish Furniture and we will assist you on filing your claim. Exact delivery dates are unknown at time of order. Our normal process is to let you know when your furniture is ready to be delivered by our driver within a 7-10 day window. We do not use big box freight companies. Our independent drivers deliver nationwide, and travel each state once per month during a limited timeframe window. We recommend the customer have an additional person who can be there for the delivery if your schedule does not allow for flexibility. If you are not able to be there during the time frame they are in your state, we will need to move your delivery to the following month. Please let us know if you have any questions prior to ordering. What do I need to do to prepare for my WHITE GLOVE IN HOME delivery? 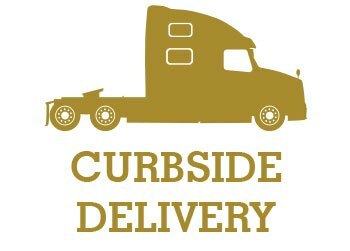 What is Curbside Delivery? $195 for your entire order to the contiguous U.S.
For curbside delivery, you must have someone present at delivery for unloading the furniture off the end of the truck, and we recommend a couple of others to assist, depending on the size of the order. It is the customer’s responsibility to take the furniture inside the home. The delivery will be made with only the driver. You are responsible for assembling your furniture. What do I need to do to prepare for my CURBSIDE delivery?